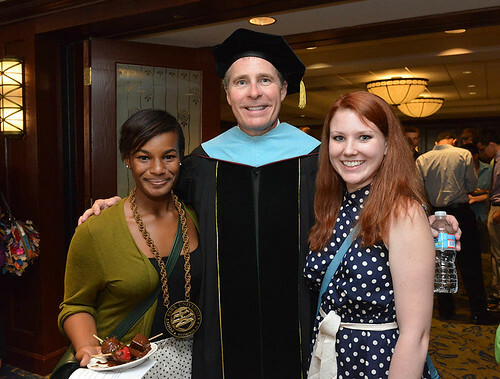 Point Park President Paul Hennigan addresses new students at Convocation 2012. More photos below. Point Park welcomed more than 400 new freshmen and transfer students to the start of the 2012-13 academic year with a fun, friendly and inspiring Convocation ceremony at Station Square on Aug. 24. After the ceremony, the new students joined faculty and alumni for a special reception and the opportunity to begin making college connections that will last a lifetime. "I'd like to congratulate all of you on achieving a very significant goal - you've graduated from high school and you've gone to college. That is a huge accomplishment -- congratulations. Now it's time to set a new goal, and the new goal needs to be, 'I'm going to graduate with a bachelor's degree.' That's the new goal: 'I'm going to earn my degree from Point Park University.'" "Get to know the faculty. ... They chose academic teaching as a profession because they are committed to your education, and to your academic and personal development. Our faculty are passionate about the subjects they teach and research. They will invest time and effort in you, but they can only do that if you seek them out." "There are people that you will meet while you are attending Point Park - professors, administrators, advisers, coaches, and mentors. ... They will teach you and inspire you and occasionally make you laugh … They will push you to engage the vibrant city in which you now reside." "I urge you to follow the path of self exploration. Go into the city that surrounds us. Stay up late at hole-in-the-wall coffee shops talking with your friends. Talk to the artists that line the streets of the South Side. Go to religious temples and political rallies and explore different world views. In short, try new things. Every single day. And if you make a mistake in the process - if you take the wrong bus or if you end in some undesirable situation … take a moment to pause and learn from that experience."